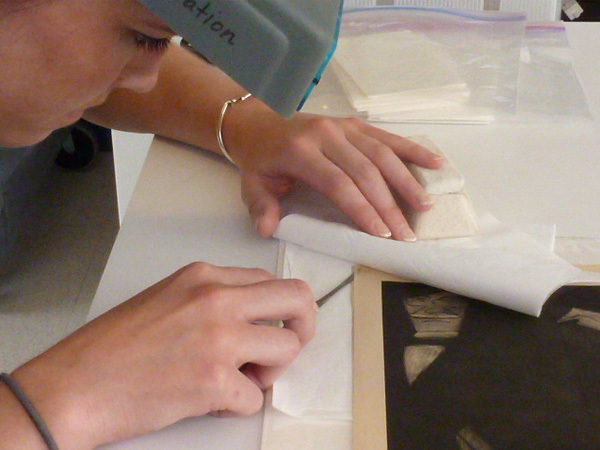 In this three part series, Conservation Assistant Caroline Hoover outlines the process of treating a photogravure by Marius de Zayas. Read Part 1 here and Part 2 here. Paper pulp was prepared from a high quality artist paper to fill in the losses around the edges of the brittle backing paper. The backing paper was wet up in order to attach these areas of pulp. Using an eye dropper and tweezers, the pulp was dropped into the areas of loss and built up to the same thickness of the original paper. Excess water was removed and the fills were then coated with a sizing agent to ensure attachment. The paper, with its new fills, was dried between felts. Afterwards, the pulp fills were trimmed to the edge of the original paper. Two tiny, thin Japanese tissue hinges were used to re-attach the photogravure to its backing paper at the top edge to secure the artwork. The picture is now ready to join its companions in a future exhibit. 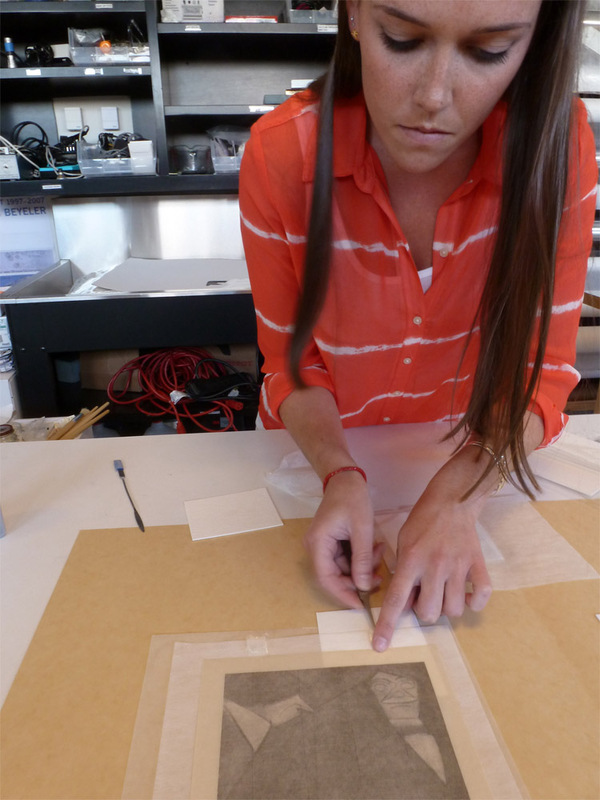 In this three part series, Conservation Assistant Caroline Hoover outlines the process of treating a photogravure by Marius de Zayas. Read Part 1 here. This photogravure on Japanese tissue was attached in the top left corner to a backing paper with a European watermark so that it could be included in the Camera Work book. Due to the single attachment, however, the tissue had swung on this point from the back page and this action had caused creasing around the attachment. The backing paper was brittle and had many losses around the edges which left the photogravure vulnerable. In addition, both the tissue and the backing paper had discolored with age. Since the piece could not be displayed with the other seven photogravures by de Zayas in its present condition, the decision was made to treat the work so that it could be included in the set. First, the Japanese tissue was carefully separated from the backing paper using a Goretex sandwich and a microspatula. The Goretex sandwich softened the adhesive without wetting the paper. 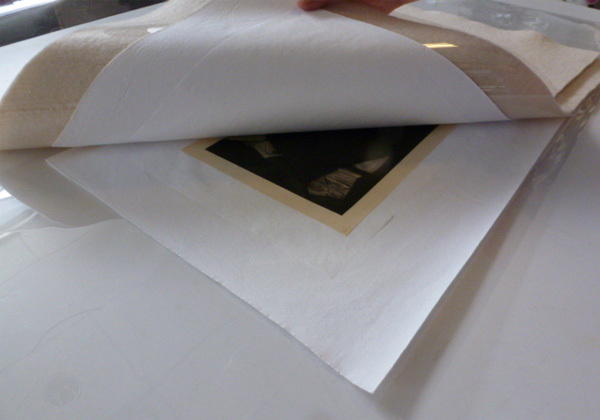 When the two papers were separated, the backing paper’s sensitivity to the ink in the photogravure was revealed. Both photogravure images, from the adjacent images in the Camera Work volume appeared on the front and back of the European paper. The backing paper was washed in alkaline water to remove any discoloration and acidity. It was then dried between felts. The Japanese tissue was humidified in a Goretex sandwich and then also washed in alkaline water to remove any discoloration. 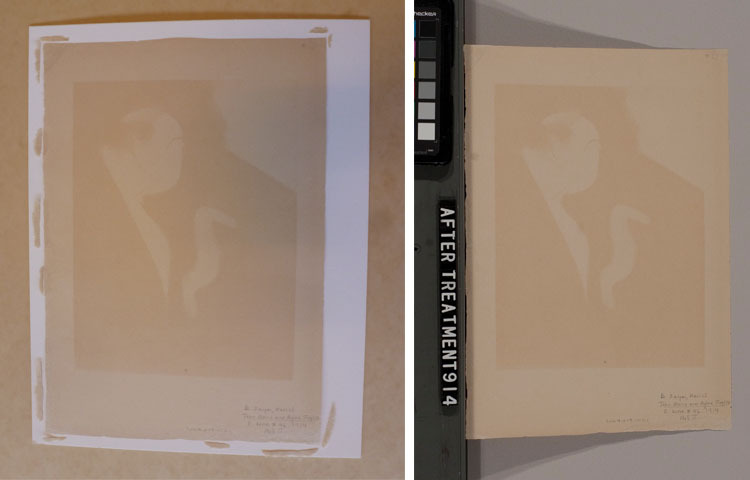 After washing, both papers appeared lighter in color. The European paper regained flexibility. 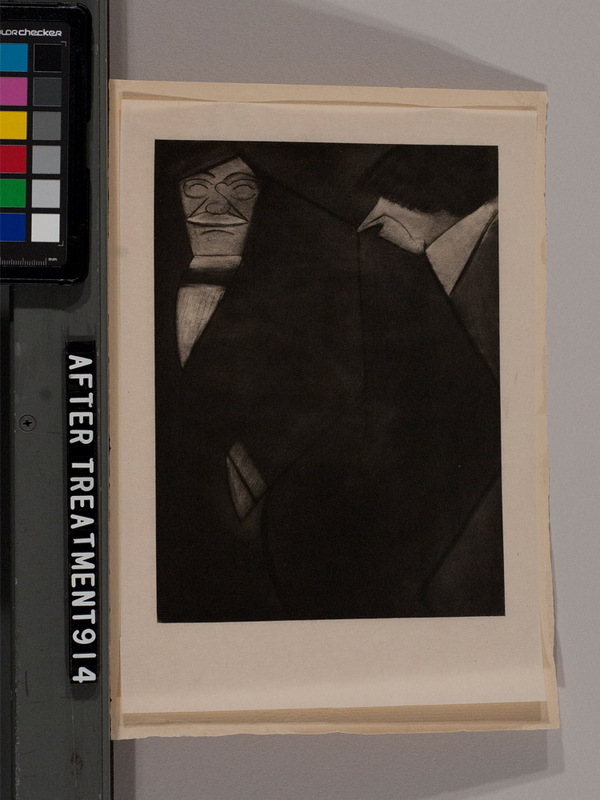 In this three part series, Conservation Assistant Caroline Hoover outlines the process of treating a photogravure by Marius de Zayas. 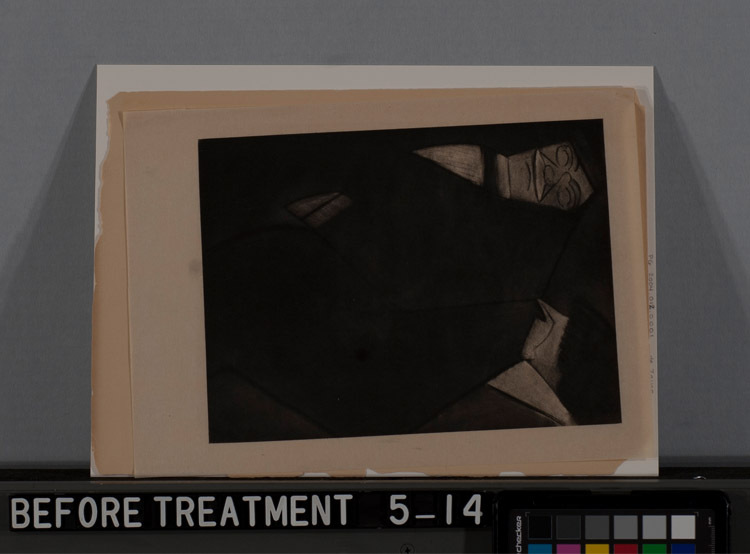 This photogravure, Alfred Stieglitz and John Marin, is a work of art that was made from an original drawing by Marius de Zayas and printed onto very thin Japanese tissue. This piece was included in a collection of artists’ works published in the periodical Camera Work XLVI, 1914. Camera Work was a well known publication put together by Stieglitz to support and promote photography as an art form. He included photogravures because they were made from original negatives and often supervised by the artist or even at times printed by the artist himself. As such, they represented the original works very closely. The publication showcased the best examples of photogravure printing. 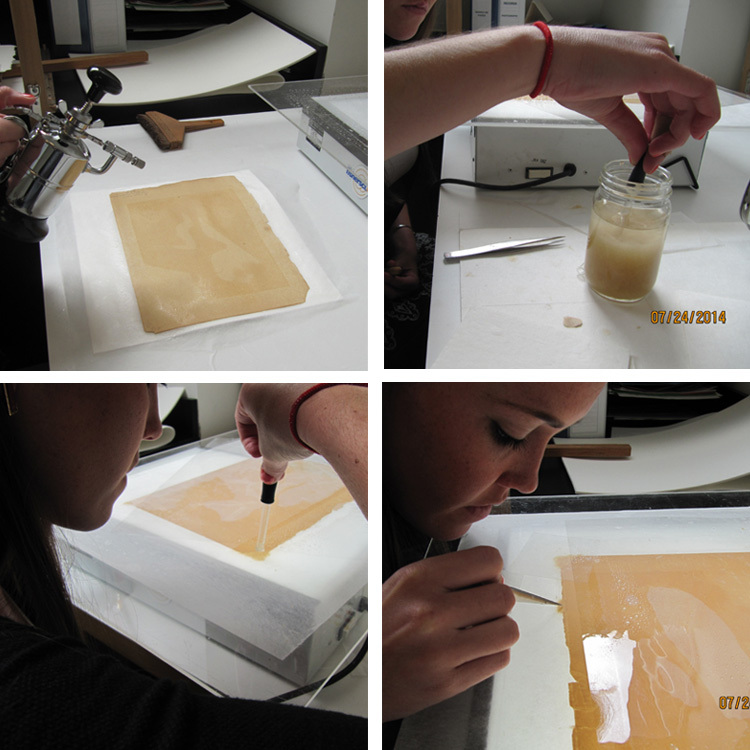 The photogravure process is the transfer of the original photo negative to a transparency as a positive image. It is then contact printed onto light sensitive paper from which it is then transferred to a copper plate as a negative image. 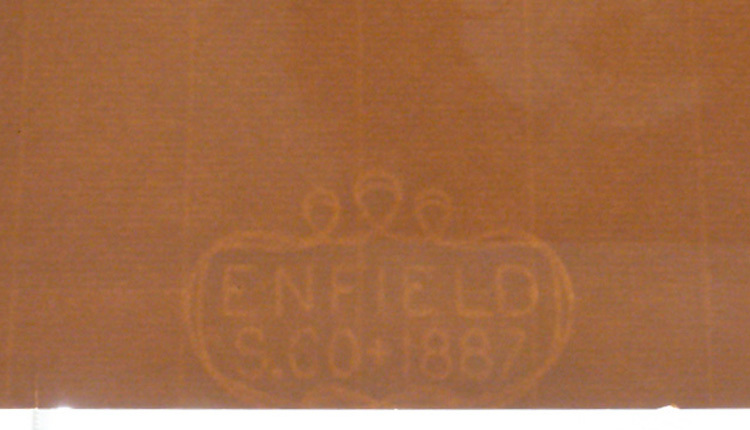 The plate is etched in acid, inked up, and printed as a positive image. As you can imagine, it was a very sophisticated and complicated process that required a lot of finesse.